Are you looking for an elegant project to wear this spring and summer that you made all on your own? 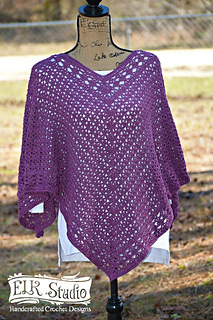 The Poncho is another featured design in the Southern Diamonds Line that is fun once you get started and very rewarding when you place that last stitch and weave in those ends. 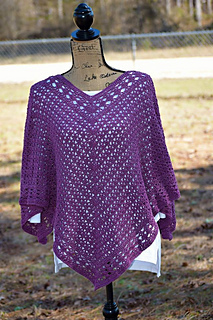 The Southern Diamonds Poncho was a Crochet-Along featured on the ELK Studio blog as a free CAL. Once the CAL was over, I combined all the information into an AD FREE PDF for you. You can still access each segment of the CAL for free should you want too. The pattern includes 17 pages of the original size poncho along with an “extended version”. You will also get stitch diagrams for the right and left-handed crocheter. There is a photo tutorial of a couple rounds that were requested by the fans. I have also included a “Frequently Asked Questions and Tips” section that was developed as the crochet-along progressed. You can join the ELK Studio Crocheter’s FB Group to keep up with all the information and get help if you need it!